The romance between James Wan and Leigh Whannell continues as the horror duo announce plans for an Insidious sequel. The films’ mastermind did not delve into too much detail on the sequel’s plot and didn’t confirm if the story would pick up where it left off, following the married couple, played by Rose Byrne and Patrick Wilson. 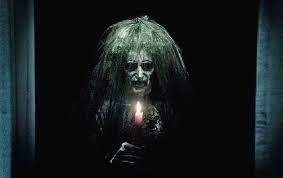 Personally, I wasn’t too impressed with Insidious and it didn’t scare me as much as I thought it would. Before seeing the film, I didn’t even want to watch the previews before bed; however, upon a completed viewing, I forgot about it soon after. It didn’t really do too much for me but obviously, a lot of horror fans enjoyed it and are probably excited about news for a sequel. Next Post Happy Birthday George! I donno, I loved insidious I feel it holds up on multiple viewings too which is strange horror movies tend to lose a lot when you know what's happening. But the story wrapped its self up so nicely I feel like a sequel would have nothing to add and if you don't follow the couple then aren't you just making the same movie with different actors? I mean Final Destination does it often but that doesn't make it right!